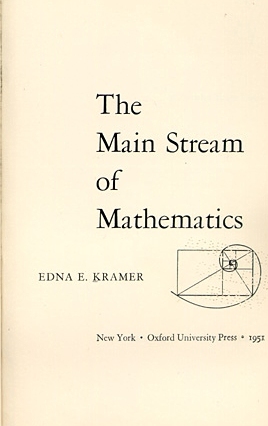 Events in August 1945 and thereafter have revealed that mathematics holds one of the most important keys to the future of the human race. The common man is curious to know how and why the science of numbers plays this basic role. The Main Stream of Mathematics attempts to appease this curiosity. Modern Mathematics with its ramifications into every conceivable area of thought is like a tree. We shall mount, climb out on a few sturdy limbs, return to the trunk, ascend a little higher, then branch out once more. Most of our time will be spent exploring the branches, which will support us between the periodic intervals of rising on the trunk. Since we are not climbing on a dare or running a race, but are engaged in our activities for pleasure, we shall, in human fashion, look outside and beyond. We shall not attempt to reach the summit or to venture out to every twig and leaf, for that would require a profound and monumental treatise. How did primitive man anticipate modern electronic brains? How does the H-bomb indicate that 2+2 does not always equal 4? What is the formula for beauty invented by a Harvard professor? What sort of mathematics flourished by the waters of Babylon? What distinguished algebraist owes his his fame to the composition of a single poem? How can playing poker help to win hot or cold wars? What does a scale on the piano have in common with a chain reaction? Wherein lies the charm of the 'Helen of Geometry'? Who is the only outstanding mathematician in history who was also a wife and mother? What was the nature of the 'Russian Revolution' in mathematics? A special feature of the book is the historical or legendary material, which has been included both to show the evolution of science, and because the facts are so full of surprises. There are few who do not know Einstein as a mathematician, but how many have heard of Hilbert? Again, most laymen have never read a word about the Hindu mathematicians whose influence on our daily lives is probably greater than that of Henry VIII or Napoleon. In a few instances we have combined fiction with fact in narrating biographical incidents. The men of mathematics come alive in association with their surroundings. It is surprising that they have almost never figured in historical fiction. We shall, of course, discuss ordinary arithmetic and algebra. Our objective, however, will be to examine their relationship to other systems of numeration and symbolism, systems that have some factors in common with the everyday species but diverge in ways rendering them more suitable for certain scientific applications. Geometry will be considered at first in relation to art and the inspiration of art—nature itself—leaving the notion of pure geometry for a later chapter. Trigonometry as a tool can stand some de-emphasis in favor of its characteristic of mirroring the eternal periodicity of nature. Statistics is no longer glorified bookkeeping but a means of testing hypotheses, controlling industrial processes, and describing the nature of matter. Calculus concepts, freed of manipulative detail, are within the reach of all. Relativity is a natural climax to mathematical discussions. Today a comprehensible outline of this subject can be offered to the layman—yet less than fifty years ago it had been mastered by only a handful of savants. The man in the street can even gain some understanding of the objectives of Einstein's new unified field theory. Finally, we must touch on a major issue of mathematical philosophy—the infinite, with is intriguing paradoxes and its inevitable association with the most profound problems of modern mathematics. At this point, I should like to express my gratitude to the late John A. Swenson for being the first to stimulate in me a love of mathematics and a desire to undertake a mathematical career. Throughout his lifetime he acted as a source of inspiration.